The What: ACE Backstage has introduced the 175SLBK Stage Pocket, which is designed to be permanently installed in the stage floor and is configured to receive PreSonus Networked Stage Boxes (NSB 8.8, NSB 16.8) for portable onstage use and passive storage. The What Else: One PreSonus NSB slides easily in and out of the ACE Stage Pocket Nesting Frame. 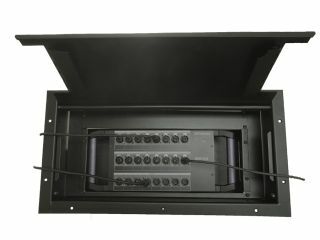 The NSB is secure while resting inside the stage pocket, allowing I/O cables to egress neatly through hinged cable exits in the lid, and onto the stage floor. Additional room for a single space rack panel inside the Stage Pocket makes it possible to add additional connectivity at the stage floor. Constructed of heavy-duty, 10-gauge steel, its lid and bezel are designed to resist bending even under the most severe stage loads, and are finished with matte-black textured power coat for scratch and wear resistance. Dual-hinged cable exits on opposing sides of the stage pocket lid pivot down to allow many cables to exit, or pivot flush to close all openings. Mounted internal rack rails mate with an exclusive nesting bracket and allow for additional single rack panel capacity. The Bottom Line: The 175SLBK is designed to support the specific indexing of one NSB 16.8 or NSB 8.8 Stage Box for optimal onstage accessibility and organized stage aesthetic. The nest positions the stage box so cable-end connectors have appropriate clearance when the stage pocket lid is closed while protecting connectivity and electronics. Power and digital connectivity can be accessed through provided single gang access positions in the bracket base.